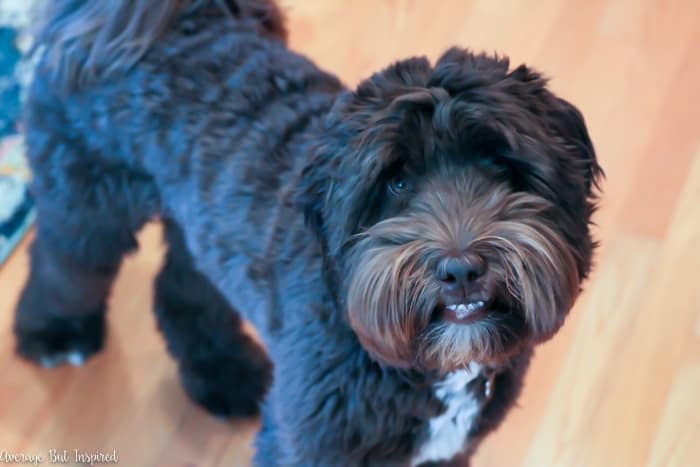 Six months ago when we brought home our labradoodle puppy, Jasper, I never would have imagined that he would become such a treasured member of our family! Of course I knew we would enjoy having a dog in the house, but the way he has blended into our lives and filled our hearts is remarkable. 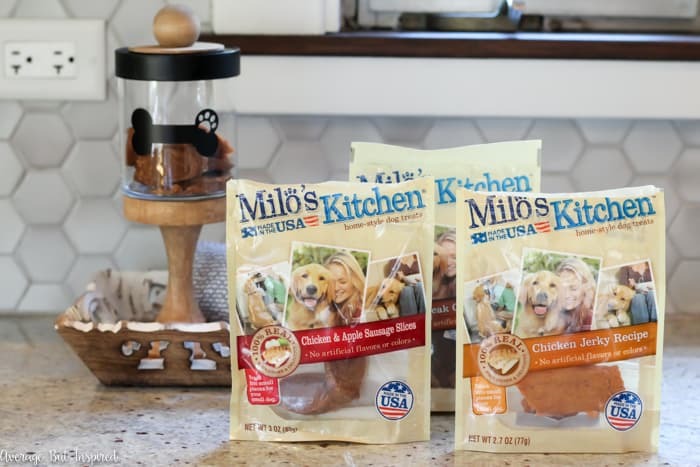 In order to get your dog pumped up to craft** with you, I highly recommend bribing him or her with Milo’s Kitchen home-style dog treats, because meat is the #1 ingredient and your dog will basically do whatever it takes to get some! (**By “craft” I mean lie under the table on your feet while you work.) 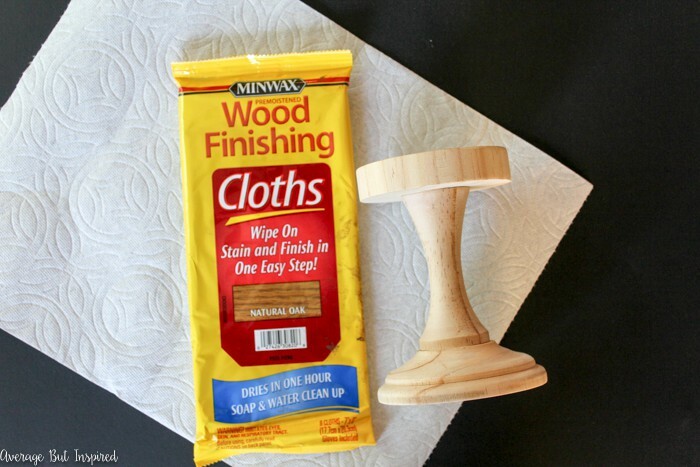 Jasper and I began by using our favorite pre-loaded stain cloths to add some color to an unfinished wood pedestal, a flat wooden circle cutout, and an unfinished wood knob. 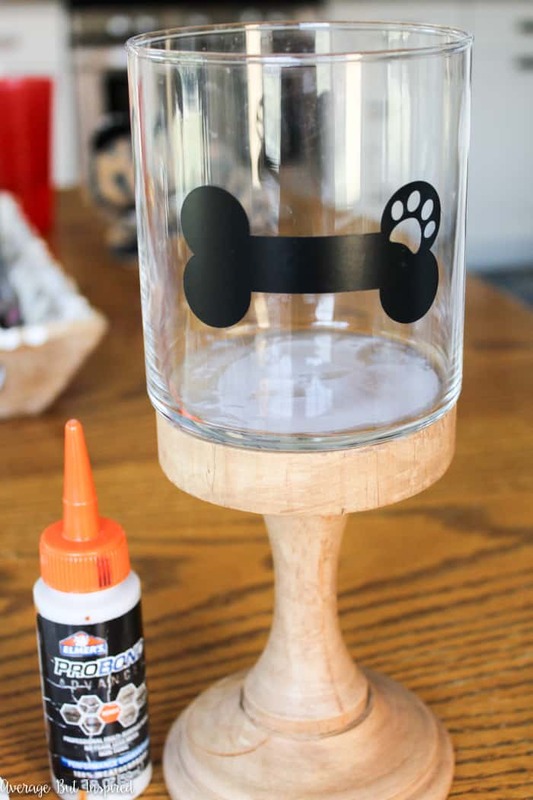 We set those aside to let them dry, and then we got to work customizing a glass jar that would hold the treats. 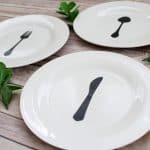 We used a glass candle jar that I cleaned out for this project because I liked the shape, but if you don’t have one of those, you could easily use a mason jar or empty pasta sauce jar! 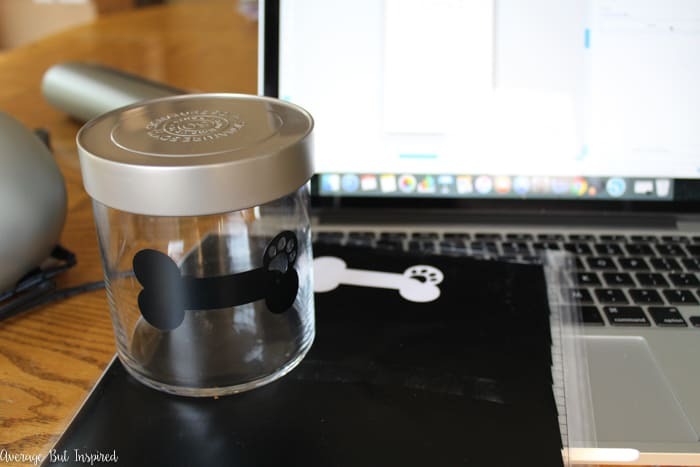 I downloaded a dog bone shape and cut it out on my electronic cutting machine. If you don’t have a cutting machine, just buy cute stickers in the scrapbook section of your favorite craft store. I promise you’ll find something great! 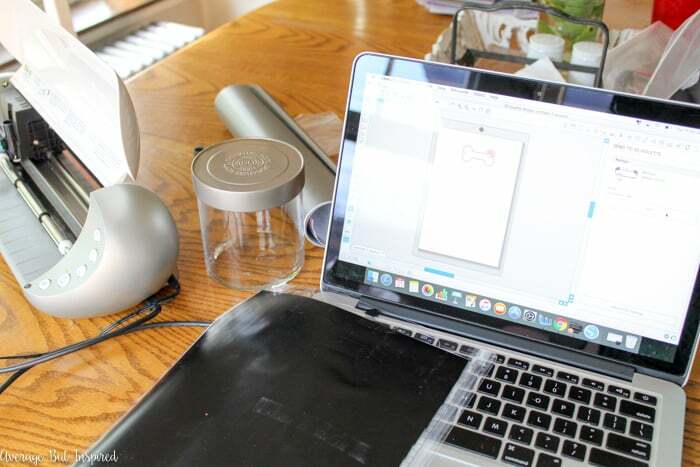 Attach your vinyl cutout or sticker to your clean jar for a cute, decorative touch! 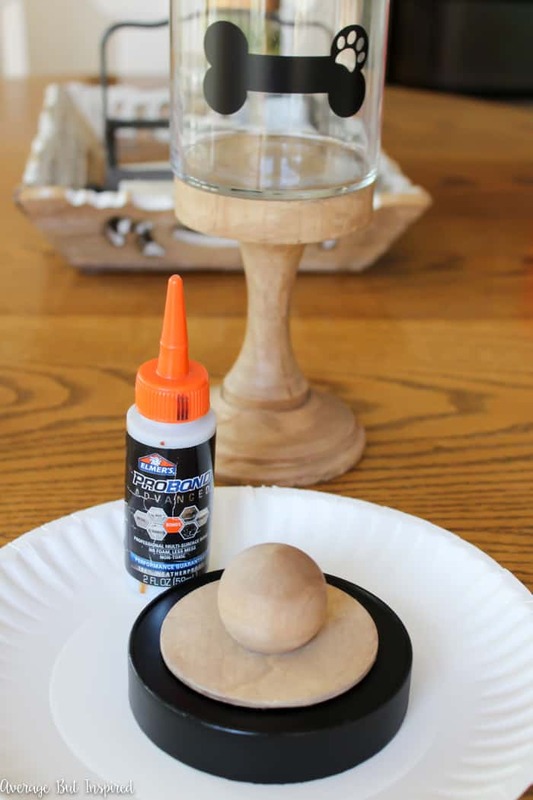 Next, use a highly-adhesive glue that bonds wood and glass to attach the glass jar to the wood pedestal. Make sure to double check that your glue will work for this type of bonding! 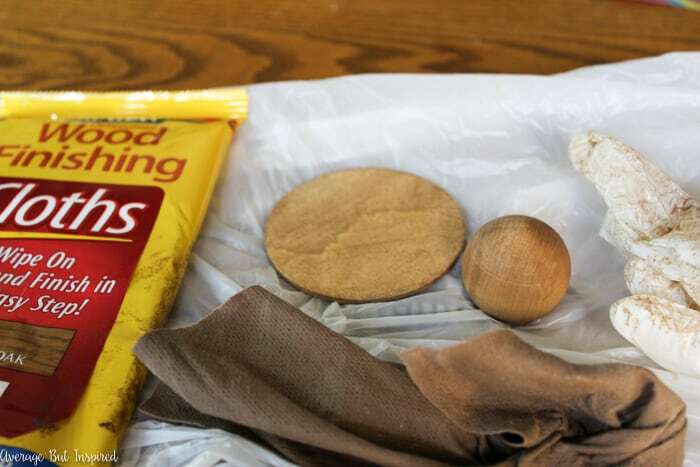 Not all glues do. 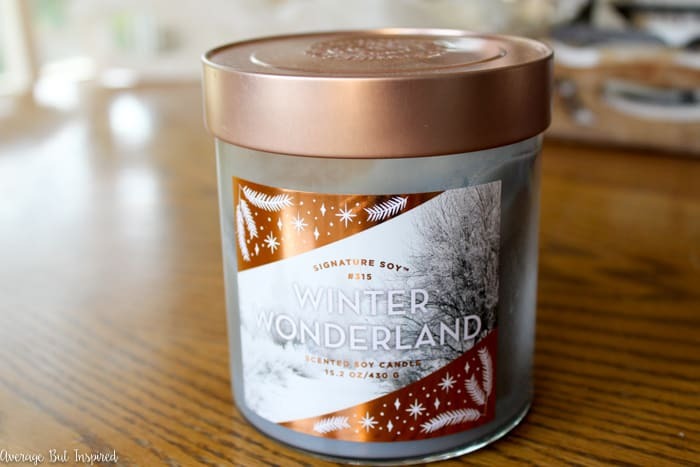 While that is drying, spray paint the lid of your candle jar to be the color you want. Jasper and I chose black to mimic the black dog bone on the front of the jar. Jasper supervised this portion of the project by licking the glass storm door and leaving slobber marks on it while I spray painted outside. 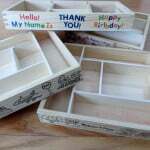 Once the lid dried, I glued the wooden circle and wooden knob to the lid in order to hide some raised text that was on there, and to add a nice finishing touch to the piece! 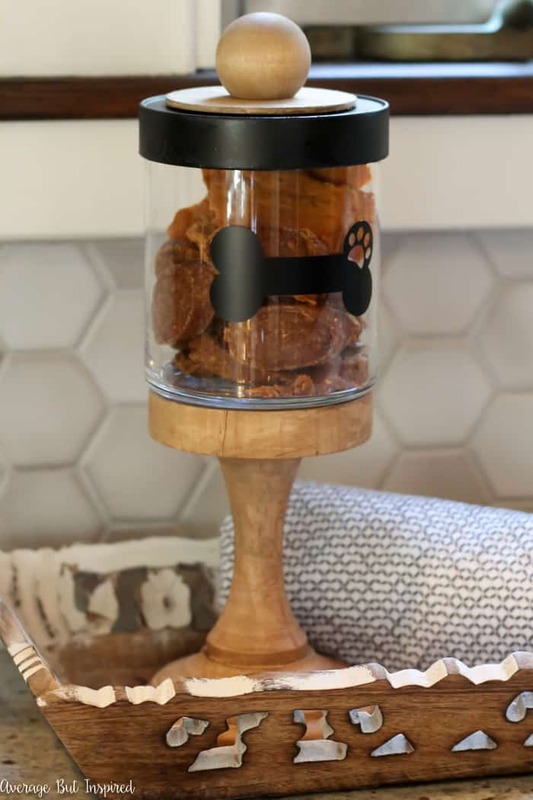 When the glue on both parts of this project dried, this DIY Dog Treat Container was ready to go! 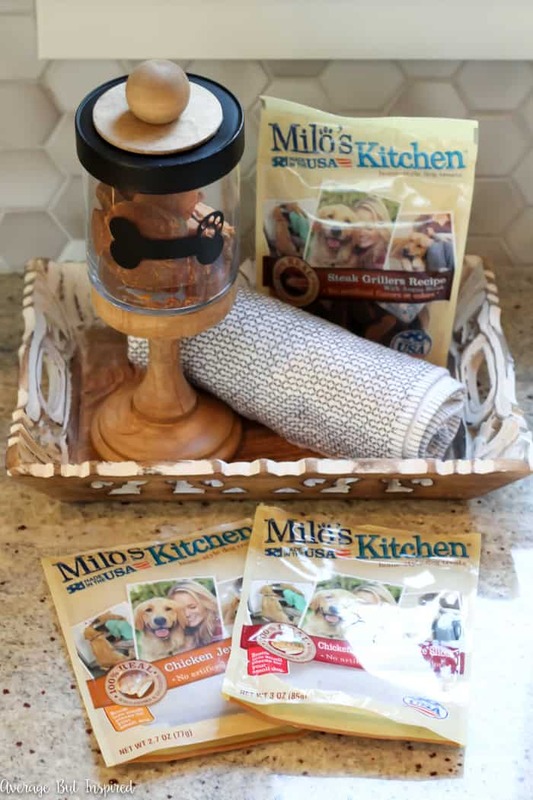 I got to work filling it with Milo’s Kitchen home-style dog treats and placed it on my kitchen counter so that my family will have easy access to the dog treats that Jasper loves! I truly believe that nothing says “I love you” more than something made with love and care. 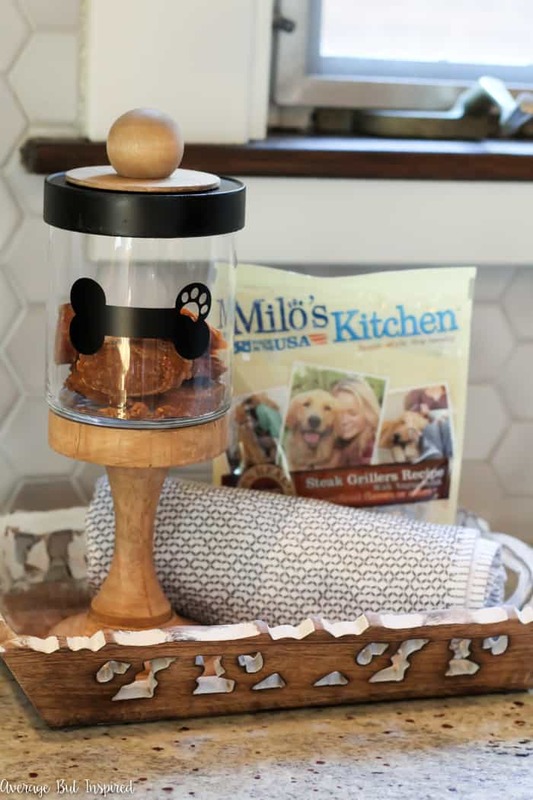 That’s why a homemade dog treat container and Milo’s Kitchen home-style dog treats go hand in hand; they’re perfect for any dog who is a cherished member of your family! Do you believe that dogs are family, too? 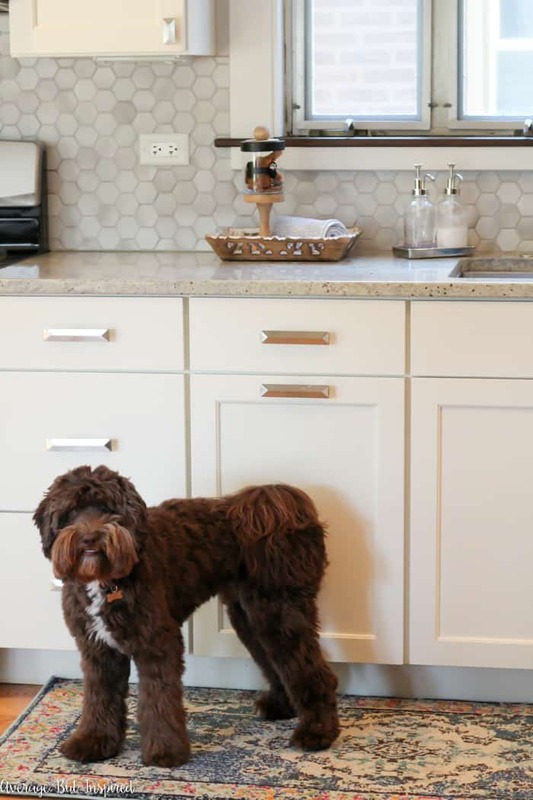 How do you show your pet that you love him or her?